Eurolotto – Free Spins for the Game of the Week! Make your deposit to receive the Free Spins! The smell of Flowers and Free Spins is in the air! Brighten your day and enjoy the best of the midsummer season on the Flowers slot, as the birds’ chirp in the morning sun, you may just find some big bucks. The thrilling Flowers slot from Netent has plenty to offer with 3x multiplier and a bright pay-out of 5,000 credits per winning bet line. Are you ready for a sunny escape? Then make a deposit of your choice to receive up to 50 Free Spins. While you are enjoying the Free Spins, make sure to wager minimum €25 on Jurassic World to secure your ticket to the massive €25,000 Prize Draw with Free Spins, Cash Prizes and a VIP holiday to Los Angeles, USA with exclusive access to the movie studios. Not yet playing at EuroLotto Casino? Then sign-up now and claim their fabulous 100% Welcome Bonus. Find out about this week’s hottest instant win game, jam-packed with the most exciting action and phenomenal wins. This week, unlock up to 50 Free Spins on Flowers when you make your next deposit at Eurolotto Casino. Only one amount of Free Spins per player based on the deposited amount. Free Spins will be credited on 26th May 2017 and are valid for 14 days. Winnings from them have to be wagered 40x within 14 days, subject to the Eurolotto bonus terms and conditions. The slot is a 5-reel, 30-paylines game that offers a visually beautiful, flowers wrapped video slot featuring wilds, scattered symbols, stacked wilds and Free Spins. 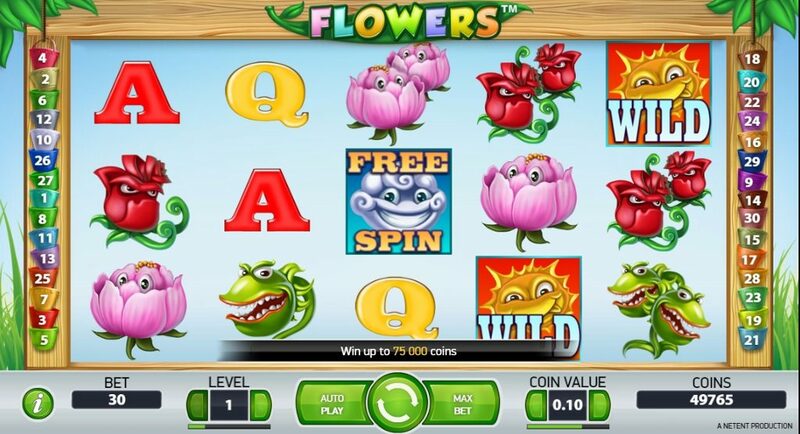 You can boost and multiply your winnings and free spins with double flower symbols. Unlock Free Spins features and add stacked wilds to land some serious cash. Scatters are waiting to be plucked and spread their 3x multiplier free spin cash rewards. Launched in 2012, the casino is operated by PlayCherry Ltd., Malta under licenses from Curacao and MGA Maltal. The website is offering on desktop, mobile and tablet Lotto, Scratch Cards, Casino, Keno with the casino games provided by Netent, Amaya, Betsoft, Kootac, Microgaming, Play’n GO, Yggdrasil. The Live Casino table are powered by Netent Live. Eurolotto – Game of the Week!